Please note: ACLTA represents Child Life Therapists. If you are interested in the field of Play Therapy (form of psychotherapy/counselling), then please refer to information on the websites of the Australian Play Therapists Association (www.apta.asn.au) and/or the Australasia Pacific Play Therapy Association (www.appta.org.au). 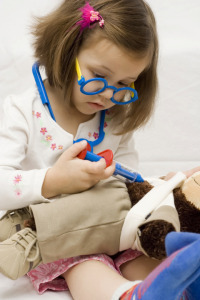 What qualification do I need to become a Child Life Therapist? The required qualification for Child Life Therapists across Australia is a degree in Education. Whilst Early Childhood is preferred, some hospitals will consider a Primary Teaching degree should the candidate be able to demonstrate significant experience with children under 8. Is a postgraduate qualification in education sufficient? A postgraduate qualification in education will only be deemed as meeting the requirements to become a Child Life Therapist if the undergraduate degree can be shown to have included at least two years of study in child development. Is there any specific training or study I can undertake in relation to Child Life Therapy? At this time, there is no specific training offered by tertiary institutions in Australia to become a Child Life Therapist. Once employed, Child Life Therapists will undertake a training package to support them to transition from the education to healthcare setting and develop the necessary knowledge and skills to work in this role. ACLTA do facilitate professional development opportunities such as biennial conferences and webinars, which we encourage those looking to enter the profession to attend. How can I find out about job vacancies in the profession? What else can I do to increase my suitability for employment? Volunteer at your local Children’s Hospital or Paediatric Ward. This is a perfect opportunity to learn about the healthcare environment while supporting the work of your local hospital. You may find there are opportunities to support your local Child Life Therapists, or other vital services. Speak with your local hospital’s volunteer coordinator to find out more. If you are completing an education degree, there may be the possibility of completing a practicum/placement in a larger Child Life Therapy Department. Usually these students will need to be completing their studies with a high grade average, and be in the final year of their degree. Contact the relevant department in your closest Children’s Hospital to check for opportunities. We wish you the best of luck in your career!